My 53 Pontiac Chieftain...Just about this same as my Dad's 53 back in the day...still needs the interior work, but a nice driver! I didn't ask for anything for the wedding but someone suggested that if I do rent it out with me driving it that I should not get any less than 200 dollars for four hours of service. 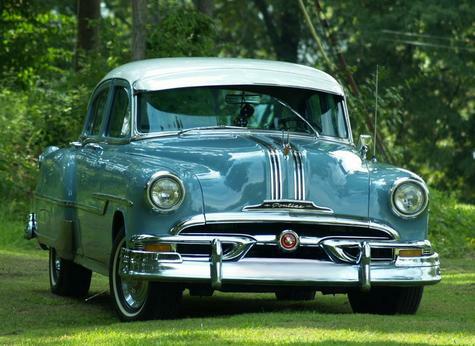 Thanks for the compliment Joe I have emailed you before and talked with you about your parents 53 Pontiac. Brandon...Oh Yeah....this is your site! I guess I didn't recognize...Ha! I thought about casting the tail lights, but haven't really figured out the stainless ring part. I think the $200 for four hours would be pretty fair...I may have to think about doing that here....and You drive the car, Right? Yes I drive it its not a trailer queen. I now has 53000 miles on it and still runs silky smooth.